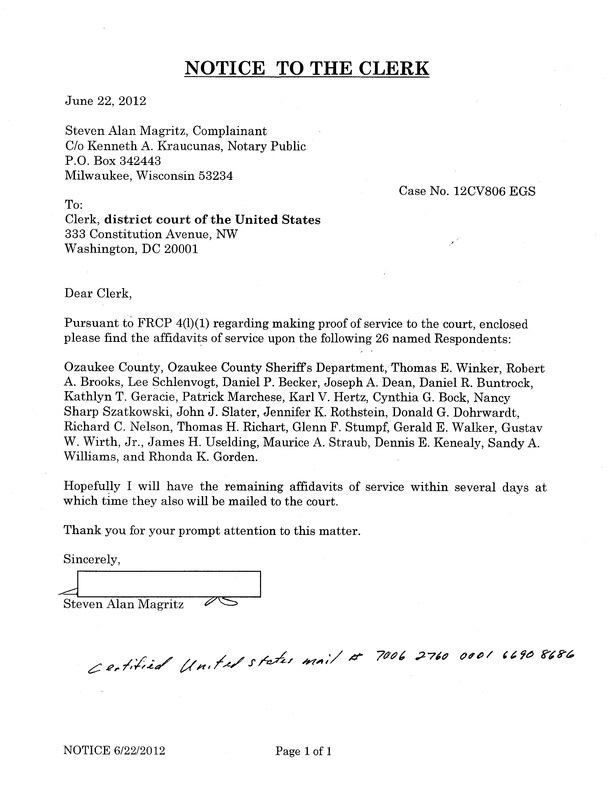 On June 26, 2012, Steve Magritz caused the process servers' Affidavits of Service to be mailed to the district court of the United States for the District of Columbia, under a cover letter indicating the proper way to mail to Complainant Magritz and the proper name of the court to which the affidavits were mailed. This cover letter, like a dozen others, such as earlier Praecipes, were not posted on the court's website. A pattern and policy was emerging. 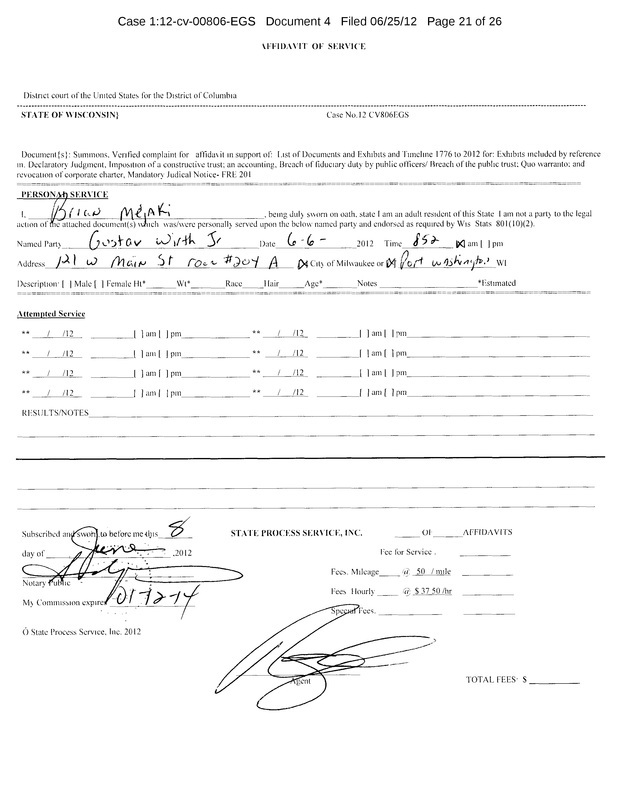 Four (4) of the Affidavits of Service of the Summons and Complaint are shown below for the more notorious members of the Ozaukee County MOB. All 26 of the affidavits evidencing service upon members of the Ozaukee County MOB are in the downloadable zip file. 1. 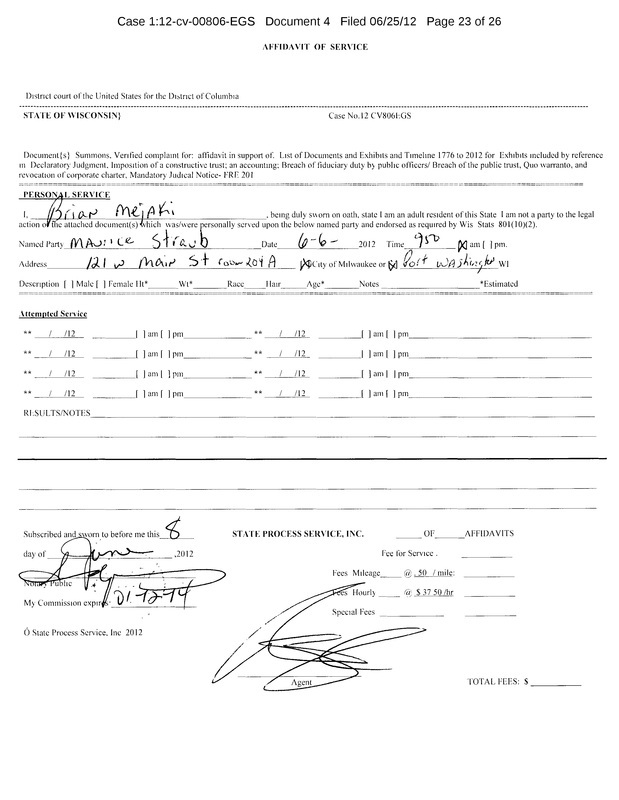 Notice the process server used an Affidavit titled "AFFIDAVIT OF CORPORATE SERVICE" for service on the Public Corporation. 2. Process Servers, Judges, Attorneys, Sheriffs, etc., apparently know "government" entities are Corporations. 3. Notice the name of the court: "District Court of the United States", NOT, "United States District Court". be made on Officer of the Corporation, the County Clerk in this instance. 5. 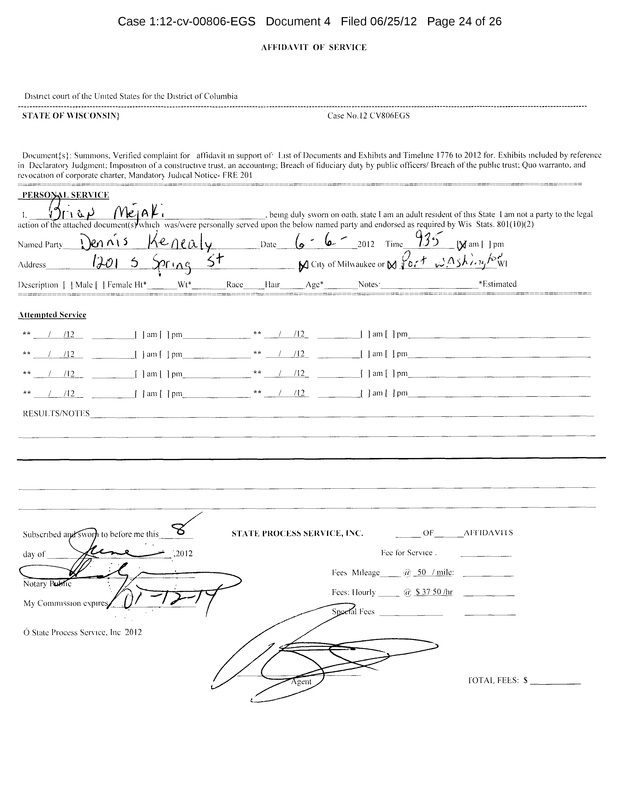 Notice the Affidavit evidences what documents are served. 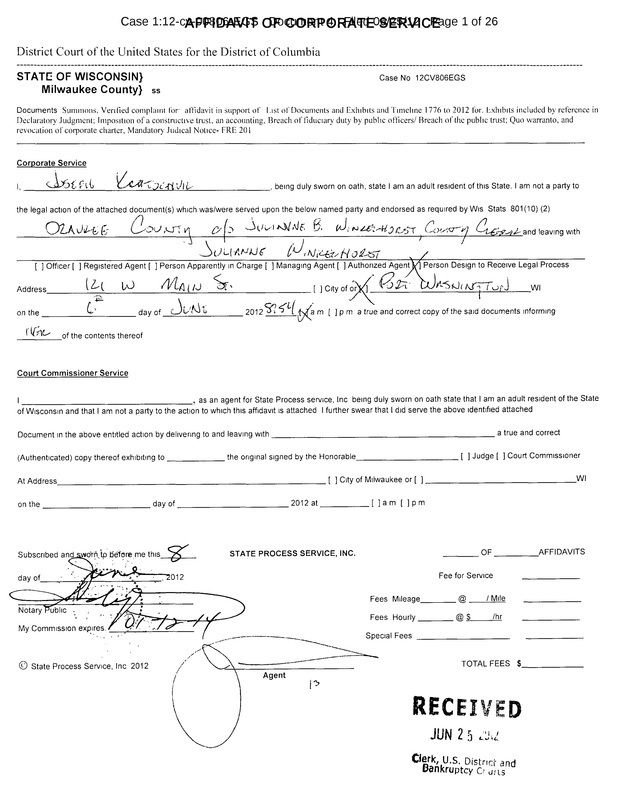 This is the Affidavit of Service on the Shyster, Corrupt Corporation Counsel Dennis E. Kenealy. Attorney Kenealy is, or more properly was, the Pied Piper for THE OZAUKEE COUNTY MOB. Without Kenealy's Criminal Breach of Fiduciary Duty, none of this would have been possible. Notice the process server used a plain "AFFIDAVIT OF SERVICE"
This is the Affidavit of Service on the chief Revenue Agent for the OZAUKEE COUNTY MOB, "Gunslinger Maury". Maurice A. Straub, affectionately known as "Maury", is the chief revenue raising Policy Enforcer for the OZAUKEE COUNTY MOB. "Maury" has never read and studied the Constitution of the United States, which he has sworn an oath to uphold. "Maury" has never read and studied the Constitution for Wisconsin, which he has sworn an oath to uphold. "Maury's" Claim To Fame is his ability to STEAL Private Property using deadly force. This is the Affidavit of Service on corrupt Public Officer Gustav W. Wirth, Jr., a member of the Board of Supervisors of Ozaukee County, Wisconsin. Wirth is a man born with a silver spoon in his mouth, and the Wanna-be "don" of The Ozaukee County MOB. Gustav W. Wirth, Jr., affectionately call "Gus" or "Sandy" by The Ozaukee County MOB, earned his place on this page by his utter contempt and disdain for the Constitution of the United States of America and the Bill of Rights. Fortunately, for the sake of documenting for all of posterity this Insurrectionist's contempt for his sworn oath, Ozaukee County MOB member "Gus" Wirth, Jr. arrogantly verbalized his contempt in a recorded interview with an Investigative Reporter, a business man and candidate for Governor of California, Los Angeles radio host Gene Forte. "Gus" threatened to use his "muscle" with the FCC to get the broadcast license for radio station KRLA revoked because Gene Forte was exercising our First Amendment secured right of freedom of speech by broadcasting the true story of the criminal acts of Corporate Counsel Dennis E. Kenealy and Attorney General James E. Doyle’s vendetta against Property Rights Advocate Steve Magritz. The Gustav W. "Sandy" Wirth threat against KRLA is evidenced on the Investigative Reporter audio + transcripts page, May 25, 2003.